A diverse but selected choice of gourmet coffee beverages, delicious salads, sandwiches and pastries combinations alongside tantalizing breakfasts, lunches and dinners. Also cakes, cookies and other special treats ensures that both first timers and repeat patrons fulfill there culinary desires in the shortest possible time. We focus on making our salads and sandwiches not only the tastiest but also the healthiest available. Each of the marrone rosso branches prepares the food on location, on customer order. All of the ingredients are of the highest quality, and we always prefer fresh and natural ingredients. Come and discover the Marrone Rosso experience and make a combination of shopping together with a relaxing coffee or a light meal. High quality is one of our priorities. From our meats to our cheeses, we' re commited to serving our best to you. 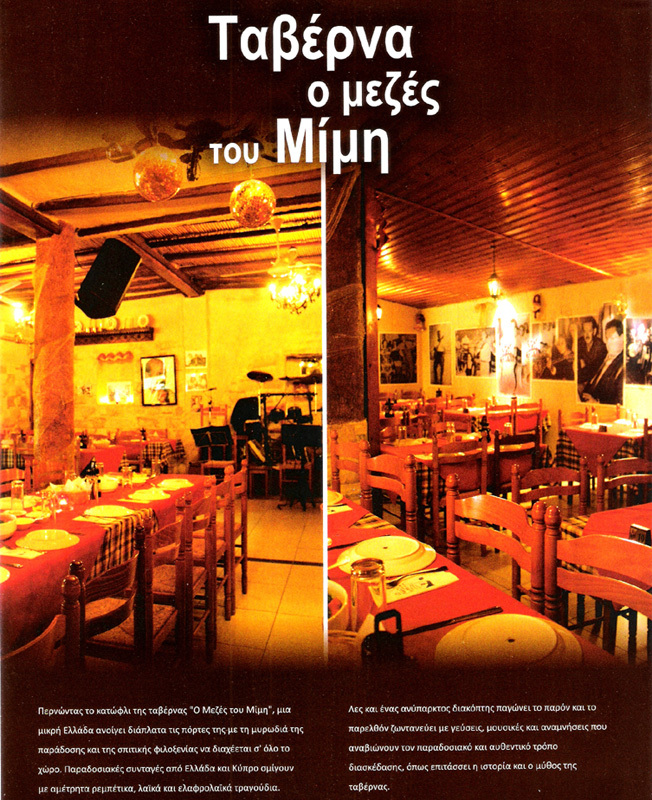 Getting in to the "O mezes tou Mimis Tavern" a small Greece opens in front of you with the smell of tradition and home made hospitality. Traditional receipes from Greece and Cyprus blend into quality Greek music. The six-member orchestra, offers a unique entertainment with a rich repertoire of quality songs and favorite folk songs and Rebetika. Open Tuesday to Saturday. Live music every Friday and Saturday night. Now we open also for Lunch as "Mageireio" and Take Away, specially cooked traditional cassarole food! Open from Monday to Friday from 10:00 - 16:00. "Mageireio" and Take Away info and Menu.